Except for a select few models that can be picked up in faux leather or similar, most car mats are constructed from durable rubber, or from strong carpet fabrics. Each of these types of car mat come with their own advantages and drawbacks. Below, we’ll look at the differences between the two, as well as which is better overall. Can be washed with light detergents or even weak power-hoses. Most mud flakes come off once dry. Usually resistant to chemical spills. Some can be machine washed, though detergents could be damaging. Wet mud is likely to leave stains between uses. Cheap rubber can flatten over time or could rip and tear. Maintain their look and feel well over time. Carpet could become flatter however. Range from cheap to very expensive, depending upon the quality of rubber. Range from cheap to mid-range in price, though often similarly priced as rubber. Mostly black by default, though sometimes come in gray, tan, or beige. Greater range of personalization options and colors. Sometimes combined with rubber. Usually ridged or with a high rim to contain any water and liquid spillages. Normally flat; water or other liquids typically absorbed into the fabric. 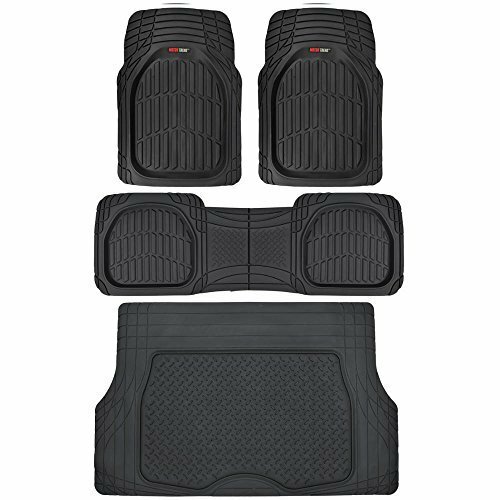 Below, we’ll look at the most important aspects of a car mat, as well as how well rubber and carpeted car mats perform within each of these categories. At the end, we’ll provide a recommendation of which type of car mat is best. The purpose of a car mat is to offer protection to your vehicle’s carpeted interiors, preventing mud, dirt, debris, and liquids from permanently damaging them. Therefore, it’s important that car mats can be easily cleaned to extend their lifespan, as no customer expects just a sole use from them. Rubber provides excellent resistance to water or other liquids, as it is not absorbent. As a result, rainwater, drinks spillage or other liquids are captured by the mat and can be tipped outside of the vehicle. In terms of mud, food or other debris, these stains can easily be removed with light washing and rinsing. The mats can be air dried once clean, but don't hang them under direct sunlight. Overall, it’s easy to keep rubber car mats clean. Unlike rubber car mats, carpeted alternatives are less effective at capturing spilled liquids; rather, the fabric-based design means that they will be absorbed into the mat. This is less of an issue for rainwater, but more of a problem if you spill a perishable food item or beverage, as this will cause the product to smell. When it comes to washing the mat, there’s a small advantage in that these types of mats can often be dry cleaned, or machine washed. Overall, the winner of this category for us is rubber car mats. 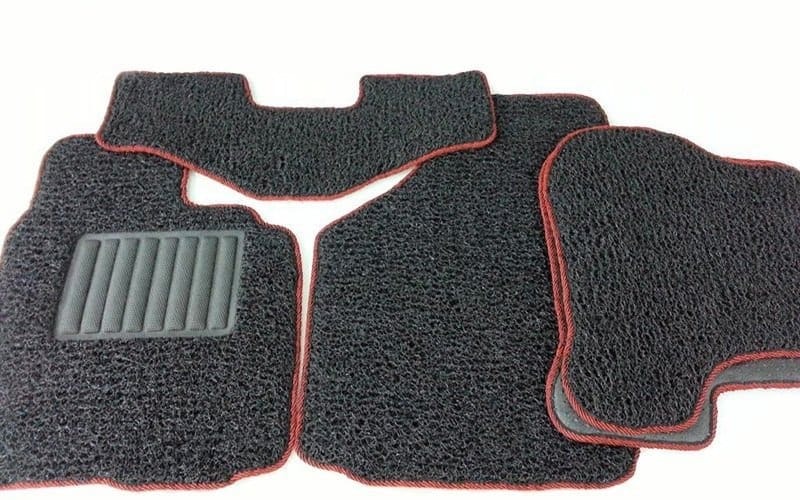 Although carpeted car mats do perform well in dry climates, the risk of them becoming stained is too great to recommend them over rubber alternatives. Durability is another important aspect for car mats. These products spend their lifetime sat underneath our footwear and are thus subjected to constant friction between feet and the vehicle’s interior. Without strong durability, car mats could soon rip or tear. Rubber car mats are more likely to rip and tear than carpeted alternatives. This provides some advantage, as they can be trimmed down to size when too large for a vehicle, though this also makes them subject to tearing if the rubber is cheap and thin. However, when talking about durability, we should again consider resistance to chemicals and other substances; in this regard, they are excellent. Carpet car mats provide greater resistance to friction and general wear and tear. Fabric is not easily torn, even under the pressure of heavy footwear. However, some flattening may still appear; it is not unusual to see heel prints appear beneath the acceleration and brake pedals after a prolonged period of use. Again, the winner of this category for us is rubber car mats. Though rubber can tear more easily than carpet fabric, it’s still a rare occurrence. Although rubber can flatten, the visual impact of this over time is less obvious in a ridged and grooved rubber mat than it is in a carpeted product. When we refer to personalization, we’re talking about the assorted options available in terms of color, trim, types of material used and design features, such as ridges and grooves. These can vary wildly from one product to another. A common feature among mid to high-end rubber car mats is the inclusion of ridged detailing, which helps to capture dirt and debris. They will often feature a high lip around the edge of the product, which keeps water from spilling outside of the mat. However, color-wise, you’re normally limited to black, gray, and tan or tan-beige. Carpeted car mats often feature greater levels of customization than rubber mats, including a larger assortment of colors, or colored trims. There also exists a type of mat that incorporates both carpet and rubber materials to achieve a more stylish look. Though personalization and aesthetics won’t be the most important thing in the world for some vehicle owners, we’ve named carpet car mats as the winner of this category, owing to the greater level of personalization available to you and your vehicle. Based on the above aspects, rubber triumphs over carpet, winning on 2 out of 3 comparisons. Aesthetics aside, rubber mats are generally more functional and reliable. By now, we’ve covered in detail the most common advantages and disadvantages of both rubber and carpet car mats. Below, we’ve condensed these points into an easy to read list of the main pros and cons of both types of product. 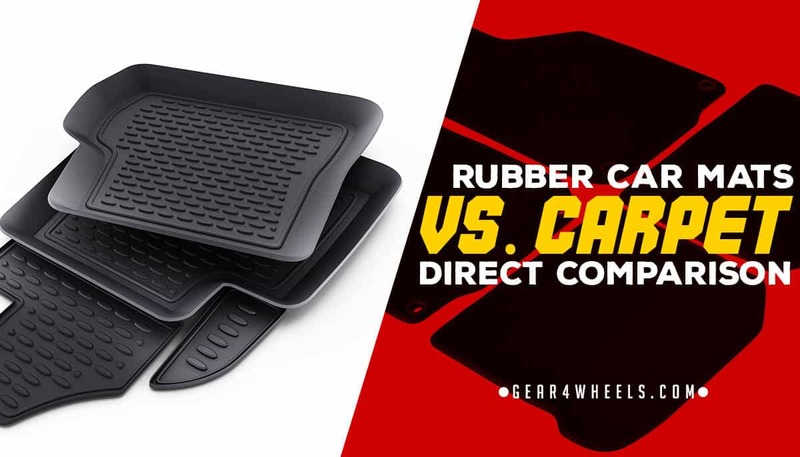 From the information reviewed above, the outright winner is rubber car mats. Aside from having a greater range of colors and designs available, carpet car mats are typically less durable and resistant to dirt and liquid. Given that this is the primary purpose of a car mat, the obvious choice here is rubber.